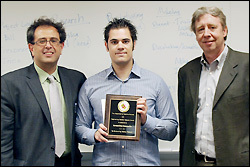 Left to right: Professor Reza Ghodssi, Konstantinos Gerasopoulos, and MSE Professor and Chair Robert M. Briber. Department of Materials Science and Engineering (MSE) graduate student and Ph.D. candidate Konstantinos Gerasopoulos was awarded first place and a prize of $1500 in the 2011 Dean's Doctoral Research Award Competition for his dissertation, "Integration and Characterization of Tobacco Mosaic Virus-Based Nanostructured Materials in Three-Dimensional Microbattery Architectures." Gerasopoulos, advised by Institute for Systems Research director, MSE affiliate professor, and Herbert Rabin Distinguished Professor Reza Ghodssi (Electrical and Computer Engineering), works on a project that seeks to turn the normally harmful tobacco mosaic virus (TMV) into a template used to build millimeter- or sub-millimeter-sized energy storage devices. The technology has applications in battery electrodes, sensors, and other micro- and nanoscale devices. The research has garnered Gerasopoulos awards, recognition in the academic community, speaking engagements, and media coverage in Discovery News and Nanowerk. To give top Clark School doctoral student researchers special recognition that will be valuable in launching their careers, and to show all students the importance of high quality engineering research, Dean Darryll Pines created the Dean's Doctoral Research Award Competition in 2009. Students submit their work through competitions at the unit level. Gerasopoulos was selected to represent MSE in the competition after winning the MSE Graduate Research Award in April (see related story).